Today is a day of celebration: a time when families and friends come together to share the love of the season. Many do so with presents. Some do so with a meal and hug or handshake. And some do so simply by giving thanks in their own way for the opportunity to remember the past and to imagine the future. Today is today, and whether that day is December 25, or June 25, or any and all in between, I wish you Happy Everything. May you please and always #ShareOptimism with the world. In thirteen days, we will celebrate Christmas. It's a commercial time of year and one cannot open their newspaper, web browser, mail or email without seeing advertisements promising the same or similar one-day sales over and over again. It's easy to see how holiday fatigue can easily set in. Optimist Clubs, and other service clubs, often find the holiday season the busiest time of year. They host fundraising events like Christmas Tree lots and activities like Breakfast with Santa, among other things, to the delight of children everywhere. Members find they are energized by the excitement they bring to others through their service; however, I have noticed they often fail to take that holiday feeling of joy, wonder and enthusiasm with them as the new year starts and programs switch to a less vigorous state of activity. Optimist Clubs spend the next few months with Scholarship Contests for essay writing and public speaking. The children are the stars of these programs too, and they are also the originator of all creative ideas as Optimist Clubs move into the role of facilitating the contests. It's easy to find academic work inspiring, but sometimes, not as much fun. For me, I find all activities performed by an Optimist Club to be inspirational and by their name alone, optimistic. 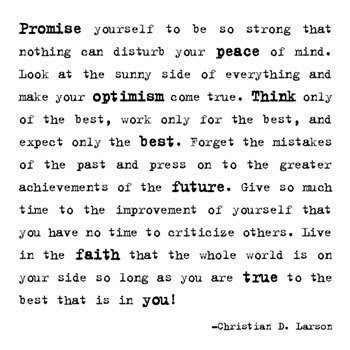 This is my reminder to you to share your optimisim all through the year. Holiday optimism is nice, but a positive, upbeat attitude is welcome at any and all times. Many cheers to you today, tomorrow, and the day after that, and so on and on. #Shareoptimism.